As you may or may not be aware, I have been rewarded with some of the fondest memories a man could ever ask for. Many times in my endeavors, Parents or people passing my facilitly or my chess events come up to me and reward me with statements such as ,what a wonderful thing I am doing with the children. They sometimes comment to me how the children are playing chess. I sometimes coment back that the beauty of haveing children play chess is rewarding in itself, I then tell them "parents love to see their children playing chess, I see the children not just moving pieces, actually playing this great game of the mind at a hightened quality". I often say children have no barriers! The story I'm about to tell you is of one that happened after a lesson on Checkmates. as simple as piece movements, some on advaced tactics, some on complicated positions and so on, always a lesson and always enjoyable. Well it happened after my lesson on checkmates, that I was going through a collage I was puting together at the club. I have been accumulating quite a bit of accomplishments, and the saying " pictures sometimes are worth a milliam words". Well the picture you see is in fact just that. Anyway, as I was going throught my pictures, one thing I am very very proud of is that at the chess club the children have reponsibilities, and they get involved with those responsibilities, and I try and usually succed in making these responsibilkities FUN. I was going throught a pile of pictures and the one in front of you I put to the side. This particular picture is one of a child who was a member of my club and very special to me. As I had played with him many many times , always feeling that he was a very talented chess player. He was no longer in my group and the reason why the picture was put on the side was that I intededed to give it to his Mother, I thought see would like it. Just recently this child asked if he could loin my afterchools chess group because he was given a chess computer game, and I gladly oked it. By the way my lesson that day was on computer chess! I never new of the true beuaty of this particular picture until after a few children asked me why "out of all these pictures, this one picture , was it taken and put to the side?" It took a kindergarten child to point it out to me, With a room full of children going throught a pile of pictures, as I previously said, and having a ton of fun, Children do love pictures you know, was it then said by a young kindergarteen child who had just recently joined my chess school. After one child would guess why the picture was on the side, saying "it was because the picture was at Pier a Park, Peter always brings us to Pier a Park, another child guessing "Master Mike is sitting in the back ground, thats why! and so on. My rewards, my joy, my passion were summed up, not by my advanced players, not by the parents telling me how nice it is that children are playing chess, but by this five year old new student of mine pointing out to me that indeed it was A BACK RANK CHECMATE!! The lesson we just completed. After hearing this, and noticing the position on the board Aaron was right! 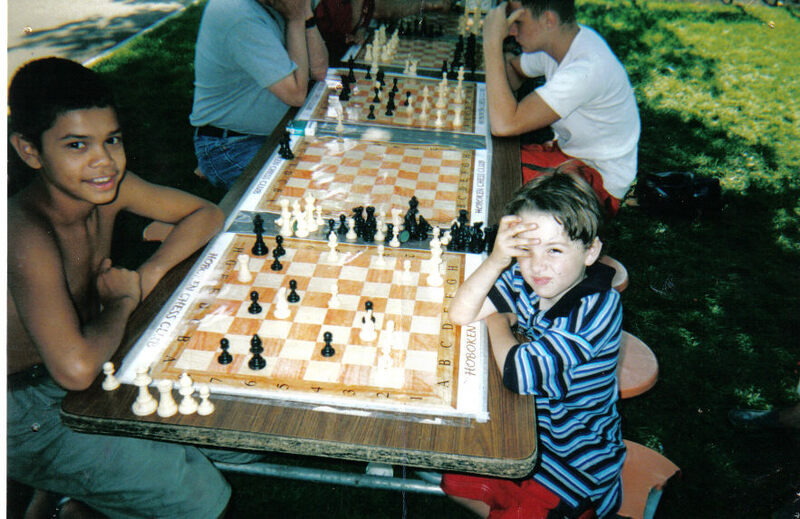 Not only did Aaron know it was Check mate, the boy in the picture, also performed this increadible task of Check mating the King!